When an individual volunteers for SPMH, that person automatically becomes a member. Fred Warren had a “leg up” in this area – he’s been an SPMH supporter since 2006 and he began volunteering over three years ago. While he appears laid back and easy going, Fred gives a dynamic tour, often getting applause from his group. While he enjoys leading all tours, his favorite is “Music Hall 360,” an outdoor look at the structure, its architecture, along with history. Fred enjoys public speaking. 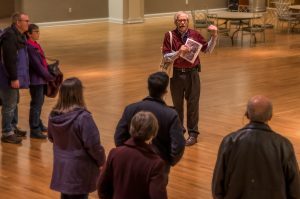 This love – combined with his history degree and interest in historic preservation – is why he looks forward to becoming more involved in giving presentations on Music Hall to groups in the community. Outside of Music Hall, Fred is a longtime volunteer for the Friends of the Public Library, sorting and shelving books about gardening and cooking. He also leads Saturday morning free tours of Findlay Market for the Corporation for Findlay Market, and is in training to be a docent at the Harriet Beecher Stowe House. The HBS house tour includes Harriet’s family, who were activists in the women’s suffrage movement and also key figures in African American history. His parents nurtured his interest in history and civil rights. When Fred was a teen, they joined citizens from around the country for the March on Washington for Jobs and Freedom, where Martin Luther King, Jr. delivered his historic “I Have a Dream” speech. Once out of the public eye, Fred heads to the kitchen to attend to his personal hobbies – cooking and listening to all kinds of music. In particular, he enjoys classical music and is a long-time subscriber to CSO concerts.